New Zealand’s elite surfers will make a return to Bay of Plenty waters next weekend when an enhanced Barrett Homes Surf Open takes place at Papamoa starting Saturday (16 February). The event has attracted the attention of recently crowned Women’s Champion Aimee Brown (Great Barrier Island) in the Open Division. She will be joined by the likes of New Zealand representative Levi Stewart (Waihi Bch) and the country’s most renowned surfer Maz Quinn (Gis), who will be making a rare competitive appearance. The 2019 edition sees the introduction of the Open Men’s and Women’s Divisions for the first time at the event while retaining the longboard divisions from previous years. Participants will compete for over $8,000 in prize money with Sunday’s finals action set to go to air live on Sky Sport. 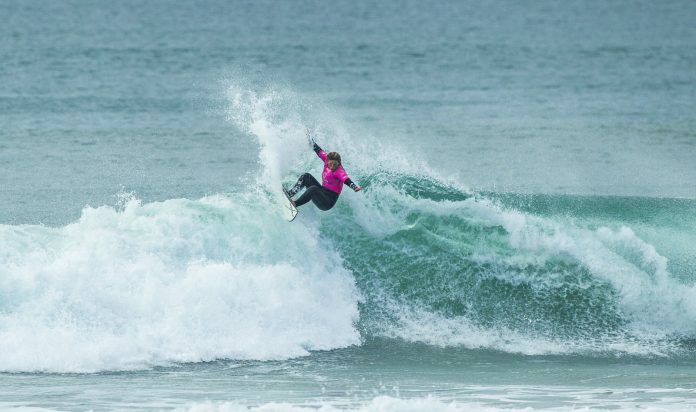 The Barrett Homes Surf Open marks the second of seven events on the New Zealand Surf Series with everyone vying for precious year-end ranking points. The Series kicked off with the Health 2000 National Championships held in pumping waves along the Taranaki coastline. The surfing was some of the best seen in New Zealand waters and the high performance levels are expected to continue through into next weekend’s. Brown, by her own admission, was shocked when she took the title in Taranaki, that despite having won the two previous domestic events in 2018. Going for a fourth consecutive win next weekend, she doesn’t see her approach changing too much. “My approach isn’t much different, I don’t want to put too much pressure on myself but I also want to do well” she said. Brown is fresh out of the age groups and will remain at her recent base of Raglan while studying at Waikato University this year as well as focussing on domestic competition. For the likes of Stewart and other hopeful national representatives, the Barrett Homes Surf Open plays a pivotal part in the selection of the New Zealand Surfing Team which will compete at the World Surfing Games in Japan this September. New Zealand placed ninth at the event in 2018 on the back of silver medallist Paige Hareb. This year, New Zealand will be sending a potent team as surfers get their first chance to qualify for the Tokyo 2020 Olympics. The Barrett Home Surf Open is not just for the elite, it will be a chance for a number of surfers to enjoy a weekend of competition in nearby waters while taking in a festive event, even for seasoned campaigners like Maz Quinn (Gis). Hometown surfers have also been quickly filling the participants’ list with a number of local legends entering such as Erin Saunders, Darren Kiwi and Cale Tolley joining the likes of Raiha Ensor, Georgia Wederell and Nick White. Red Beach surfer Thomas Kibblewhite returns to defend his title in the Men’s Longboard Division and is looking to make it two wins from two this year after winning in Taranaki just under a month ago. Kibblewhite will face some serious competition in the form of New Zealand teammates Hugh Ritchie (Chch) and Zen Wallis (Piha) who will also be in action and hoping to retain their places in the longboard team which will head to France at the end of May. Papamoa based Barrett Homes has a proud history of supporting events in the area and making things happen for the community. This will be the third year they have backed the surfing event and the local surfing community with this year’s edition set to be the biggest yet. The event site will include a VIP area for guests and participants as well as food vendors and plenty of viewing spaces for friends, family and fans. Event partners, The Island, will be hosting everyone for the Saturday evening function before the final day of surfing takes place on Sunday. Action will take place at the Pony Club Car Park just north of the Papamoa Domain from 8am – 4pm daily on Saturday and Sunday. Click here to view the full Surfing New Zealand calendar of events. For further information on the 2019 Barrett Homes Surf Open, please contact Surfing New Zealand’s Ben Kennings on 021 2278732 or email benkennings@surfingnz.co.nz. Generous support from Barrett Homes, The Island and Tauranga City Council has made this event possible. Follow live scores online at Barrett Homes Surf Open. Keep an eye on all social media platforms – @surfingnz. Follow the event hashtag – #BarrettHomesOpen.